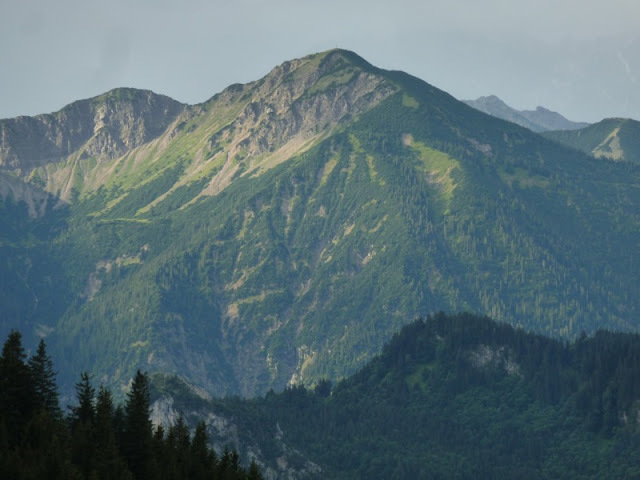 John Hayes Walks: Friday 22nd July Hornlehutte to Walchensee. Friday 22nd July Hornlehutte to Walchensee. On my own today as my bovine challenged friends came a different way to Walchensee. After yesterday's marathon today's walk was much easier and although it was 27 kilometres long involved very little climb. Left Hornlehutte at 8 and was at Walchensee by 3. Hornlehutte was perhaps a little more primitive than Kensenhutte where I stayed the night before. Just a dormitory, no family rooms and no showers. Good food though and as I was the only person there was able to spread out and get cleaned up. The first part of today's walk involved a walk along the top with great views down to Unterammergua and the mountains beyond, which at the beginning of the day you could see. The ground however was very wet and the cattle have really churning it up. The next part was a very steep 1,000 metre descent through trees down to Grafenaschau. Was grateful for the trees as they provided some cover from the rain but it was treacherous and I did manage to fall over a couple of time. The most boring part of the walk was from Grafenaschau to Eschenlohe. A flat 7 kilometres on roads across what must have been the bottom of an old lake. Two cars stopped to ask me the way and both were disappointed with the response. It's amazing how often people in cars stop to ask a man plodding across the countryside with a large bag on his back local directions. 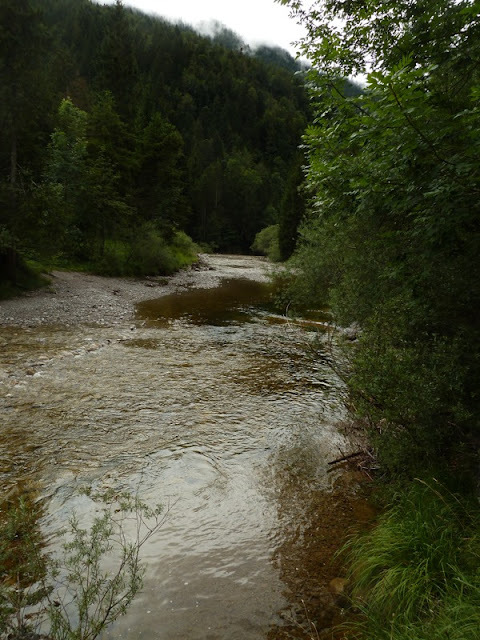 The last stage of the walk, along a valley from Eschenlohe to Walchensee was the nicest. There are E4 options here, one which takes you over a hill and one which sticks to the valley. 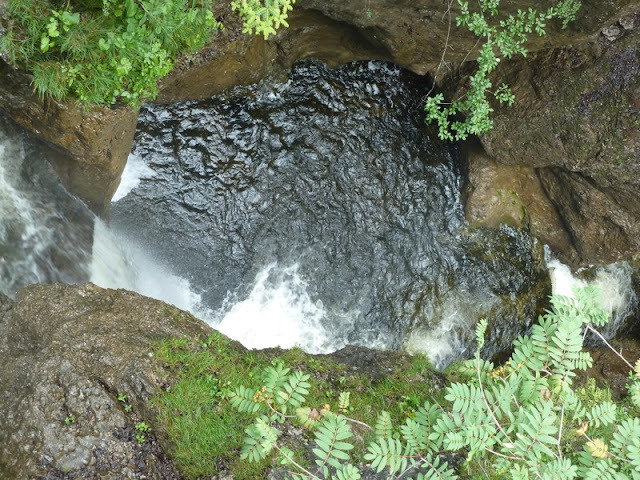 The valley for the most part has a river running along the bottom and at some points this cuts a really steep gorge. The location of the accommodation meant taking the valley bottom route. 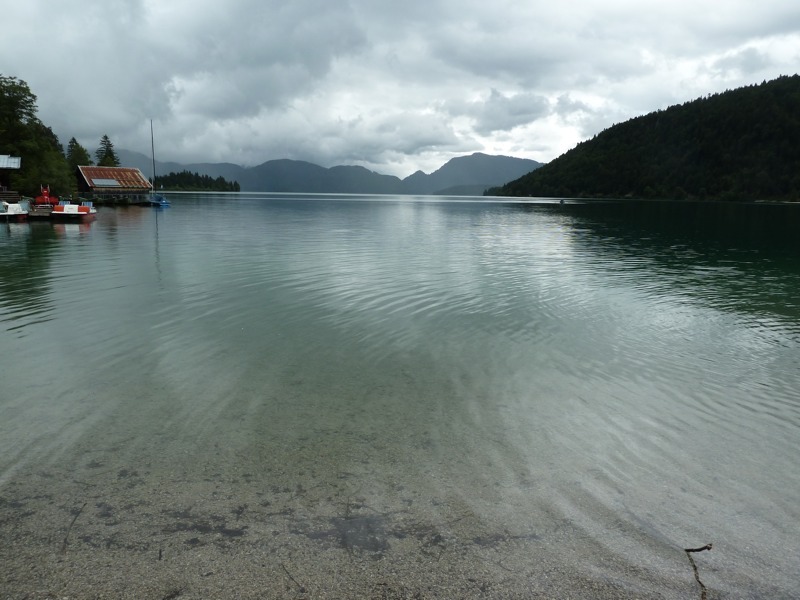 Walchensee of course is another large lake, going to see lots or large lakes over the next couple of weeks, and hopefully I'll get to see one when the suns out and it's not cold and drizzly. The rumour is that the weather will get better in a couple of days. Have been joined by my cousin John Tatam today so there should be four of us tackling tomorrow's walk. After yesterday's failure as an E4 guide I have a chance to redeem myself or fail on an even bigger scale. Seeing Roger and Sue later on this evening and will get an update on the what happened with the great cattle ambush. Another near miss, John! We also walked the valley from Eschenlohe to Einsiedl near Walchensee, after we had decided not to climb because of the rainy and cloudy=foggy weather. I am afraid that we found out that this valley is not part of E4 although Kompass claims it is. Don't worry, I will not tell any of your Nepalese kids about it. I also went from Hornlehutte to Walchensee in one day. When I told a Munich couple at the hutte my plan they pointed out that Maximilian had a horse, implying I might be overambitious. They were right! After an easy walk to Eschenlohe (and lunch) the E4 takes you up the mountain of Heimgarten (1790m). The sign said 5 hours which was only slightly pessimistic. 4 hours later, sipping a lemonade from the cafe at the top of Heimgarten I had a choice, follow the E4 along a "black" route to Herzogstand for 2 1/2 hours where there might have been room for me in a hutte, or follow a "red" route to Walchensee, which has a range of accomodation (also 2 1/2 hours). I had been warned that black routes could be narrow and have large vertical drops beside them, and looking from Heimgarten, the path to Herzogstand certainly seemed to go along the top of a very sharp arete (edge), with no-one in sight to see me fall. Probably the path was wider than it appeared from a distance but it was 5 pm and I had been walking for 9 hours, so I took the path to Walchensee. Unfortunately, arriving at around 7 pm I discovered September was peak season and all the accommodation (including the campsite) was full, thankfully a kind landlady took pity on me and gave me a room she had been keeping back. A very long day. Sounds like an epic day, when I did this stretch everything was in a bit of a muddle because of the previous day's adventure with the frisky cows. It's 5 years ago but my friend still mentions it every time I see him.